He suddenly circles, tilts his head, stumbles, and “plops” onto the floor. 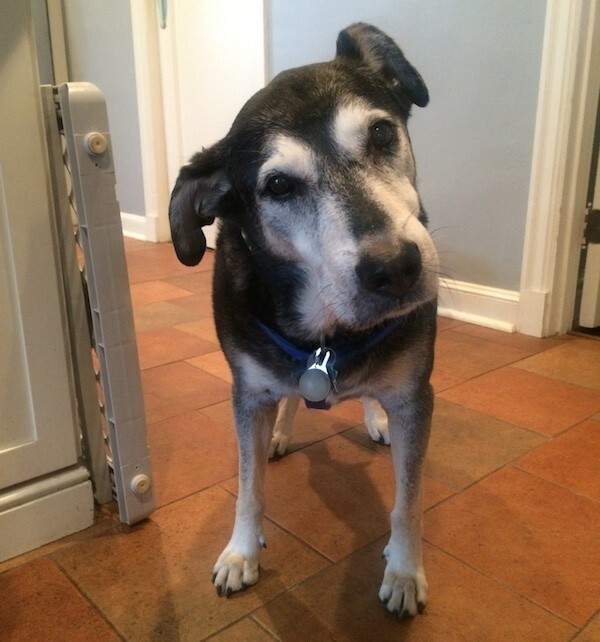 Uh-oh looks like our 13-year-old (and still filled with crazy energy) dog, Chuck, is in for a few dizzy and distressing days. Peripheral vestibular disease in dogs has stealthily slid into our home again. Yes, I said “again.” Chuck is not our first sufferer. He is the third of our family’s pooches to meet this sneaky equilibrium-disturbing intruder as teenage years arrived. 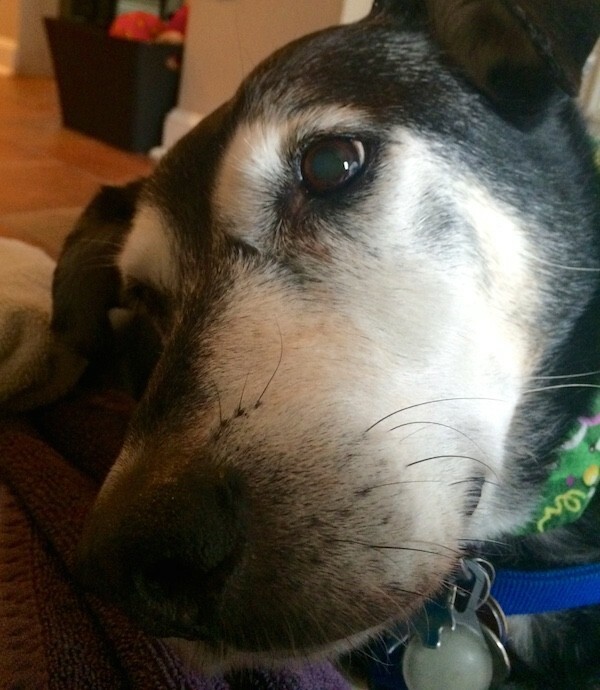 So, what is peripheral vestibular disease in dogs? According to the Vestibular Disorders Association, it is a problem with the inner-ear sensory receptor organs — the peripheral component of an animal’s balance system. These vestibular structures send the brain crucial information about where the body is in space (e.g., moving quickly, standing, leaning, falling). An effectively functioning vestibular system allows our pets to balance, run, jump, and live action-filled lives. But when malfunction occurs, acute and frightening symptoms manifest. A dog may experience an extreme head tilt, dizziness, circling and falling, with eyes shifting rapidly and repeatedly. He may be nauseous (with a corresponding lack of appetite and interest in drinking), vomit and have diarrhea. Our sweet Chuck suffering from peripheral vestibular disease. Photography by Chris Corrigan Mendez. What causes peripheral vestibular disease in dogs? Dr. Sebourn then recommended the four top actions to implement when you find your dog experiencing vestibular disease symptoms. With these in hand, we are ready to support our old boy, Chuck. 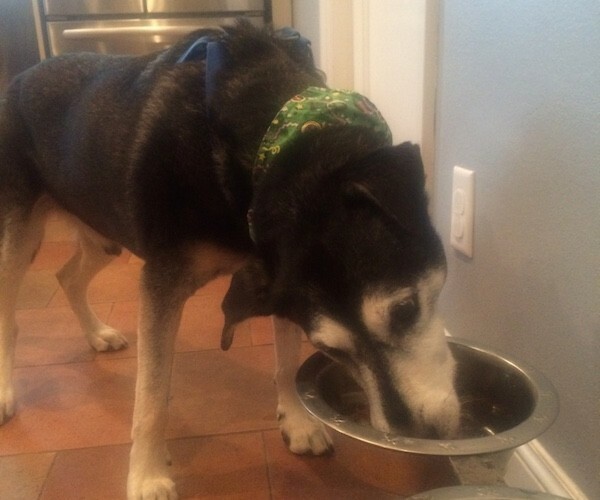 Pushing his bowls up against a wall helps Chuck eat and drink when he’s battling peripheral vestibular disease. Photography by Chris Corrigan Mendez. Your pet’s medical professional will be able to look more closely at the symptoms, provide her opinion about the vestibular problem, and determine if its cause can be readily identified. She can also provide medicine to help support your dog. For dizziness (and resulting nausea and vomiting), Meclizine is a widely prescribed, standard treatment. A newer drug, Cerenia (maropitant citrate) available as an injection (and used with success by Dr. Sebourn on many pet patients), could be an even swifter support. And your vet can prescribe or recommend over-the-counter medication to help reduce your dog’s diarrhea, if that is an issue. Limit the possibility of tripping, falling and injury. For us, this means gating staircases in our home so Chuck won’t start a journey up and tumble back down. We are confining Chuck to the kitchen if we have to briefly leave the house and are clearing the floor of items that could trip him. We are using a harness to provide him support when we guide him outside for potty needs and stay next to him so he can lean on our legs as his body drifts. We also trimmed his nails for increased stability. He will need supportive bedding, accessible water, meals that are easy to digest and attention. 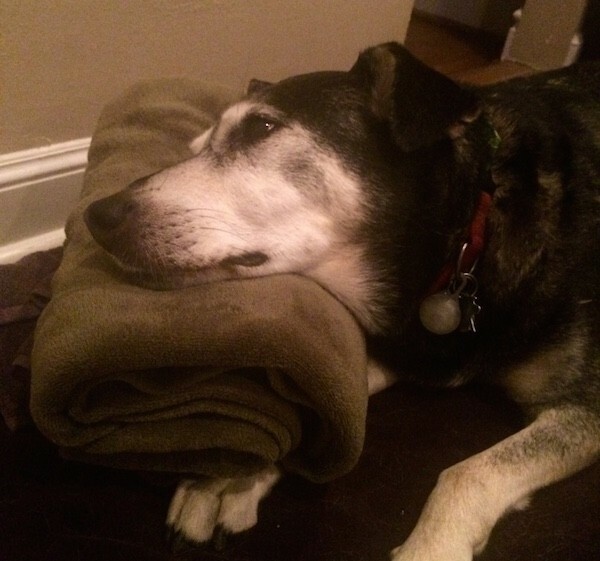 For Chuck, we are bundling up blankets and lining his bed so he can lean his right-tilting head and body on them. When positioned this way, he is able to close his eyes and rest. We moved his water bowl flush against the wall, and placed it on a slightly elevated holder, so he will not have to lean down too far to drink. We changed his food to a bland, easy-to-digest chicken and rice combination, and, in addition to using the raised bowl stand, we are bringing his food to him and holding it so he can reach it easily. And we are spending time with him at floor-level — petting, calming, and just being there while his world is topsy-turvy. We try to keep Chuck as comfortable as possible during an episode.Photography by Chris Corrigan Mendez. This means keeping track of water drinking, eating and symptoms. Your pet needs to stay hydrated and consume at least a small amount of food. A lack of drinking will require a trip back to the vet for IV fluids. Ongoing diarrhea may force the same. Your pet’s symptoms should start to lessen in a few days. If they do not, more testing may need to be done, as other diseases can exhibit similar symptoms. For our Chuck, we are keeping a close eye on his hydration. He remains very interested in drinking water, actually consuming more than usual (a relief). And his food intake is mostly on-track, as he does eat the modified diet (without his typical enthusiasm, but that’s okay). And now, three days into his illness, we are seeing some progress, with Chuck’s eye movements slowing and his mobility increasing. While he is still right-tilting, he is doing a better job walking down the four stairs to our backyard (with assistance) and shows more vitality and interest in his environment, evidenced by a serious bark today at a trespassing squirrel! We are confident he is over the hump and will soon be back to his energetic self. Chuck is on the mend. Photography by Chris Corrigan Mendez. I hope your dog will never be invaded by dizzy canine peripheral vestibular disease. And I truly wish you do not experience it with multiple pooches, as we have. But know if your pet’s world does start spinning, you can handle it! Just take some deep breaths, follow these four recommended steps, and provide support while he successfully battles this illness and returns to a much more stationary world. About the author: Chris Corrigan Mendez, M.Ed., PLPC, NCC, is a professional counselor in private practice and the proud guardian of four rescue pooches. She leads a pet illness and loss support group and provides individual counseling to bereaved pet guardians. Chris practices under the supervision of Helen Conway-Jensen, M.A., M.Ed., LPC, NBCCH, LIC #2002021231. Follow the author at ccmcounseling.vpweb.com and facebook.com/ccmcounselingstl. The post Peripheral Vestibular Disease in Dogs: 4 Things You Can Do About It appeared first on Dogster.